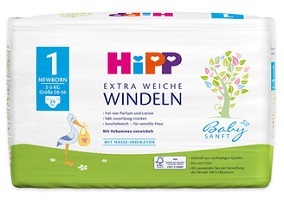 Hipp, the German infant products firm, is developing its offering in the personal care space with the launch of a range of nappies as part of its Hipp Babysanft (“Baby Soft”) brand. Marketed as “extra soft”, Hipp nappies are described as being especially kind to skin, thanks to a “unique softness” formula and the avoidance of “undesirable additives” such as perfumes and lotions. They are also said to be made from FSC-certified paper and, in some cases, to include a “moisture indicator”. Available from April, the Hipp nappy range includes products labelled Newborn 1, Mini 2, Midi 3, Maxi 4 and Junior 5, sold in both regular and “jumbo” pack formats. Hipp nappies join other products in the firm’s Babysanft range of personal care products for babies, including shampoos and bath products, oils, wipes, lip care and sun protection products.